WINGER, Ian Dauth went within a few centimetres of cementing his place in inter-state rugby league folklore when he missed with a conversion shot after the fulltime hooter in the second match of the 1978 series at Lang Park. Queensland scored three tries to two by New South Wales, but the goal kicking of Blues centre, Mick Cronin made the difference. One minute from fulltime young Qld centre, Peter Eastwell from Brisbane Wests, slashed through the Blues defence to score in the corner in the tackle of fullback, Graham Eadie. Dauth, from the Nerang club, lined up the conversion as the hooter sounded, and although he struck the ball well, it swerved away outside the upright. It was his sixth miss from seven shots and the former Brothers’ star was a forlorn figure after the game. Queensland’s defence and their fitness was a tribute to coach, Barry Muir. KB Man of the Match was Qld halfback, Greg Oliphant, but everyone’s poster boy was dashing little Innisfail winger, Kerry Boustead who scored the try of the night after great lead-up work by Norm Carr, John Lang and Eastwell. Queensland had lost the first match of the series 25-19 with Lang scoring two tries. The Blues made it a clean sweep with a 28-12 win at Leichhardt Oval, young five eighth, Steve Martin named man of the match. But Boustead again stole the limelight, this time outplaying giant Test star, Mark Harris after another colossus, Terry Fahey had been left in his wake in the earlier games. Boustead scored both Qld tries, and Dauth was on target with his conversions shots. 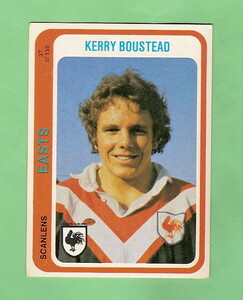 There was no denying Boustead a place in the Australian team chosen to play New Zealand at the SCG, although Fahey got the other wing spot. The team was: Graham Eadie; Kerry Boustead, Mick Cronin, Steve Rogers, Terry Fahey; Bob Fulton, Steve Morris; Ray Price, Rod Reddy, Greg Pierce (c), Ian Thompson, George Peponis, Graham Olling. Res: Greg Oliphant, Terry Randall. Boustead, Reddy and Oliphant were the only Queenslanders, but Reddy played for NSW that season under the residency rules that applied. ← 1958 Lions Tour. Part 2.